When I was living in Japan I decided to cook an English Christmas Dinner for we expats. I couldn’t find a turkey but I did manage to get a whole chicken. Much planning was done and a few problems solved by phoning mum back in the uk at 3am for emergency stuffing advice. Then came the really fun part, the actual cooking. In that kitchen I only had a toaster oven, a microwave and two hobs. I borrowed another toaster oven from another flat and managed to cram the chicken inside by squishing it a bit. It was a baptism of fire but that was my first roast dinner. Now I’ve got it down to a fine art! Roasting a chicken couldn’t be simpler. Shove half an onion and half a lemon inside, salt and pepper of top, bop it in the oven. Done. A delicious main meal in less than 5 minutes. Steam some veggies in the last half hour of cooking and you’re sorted! 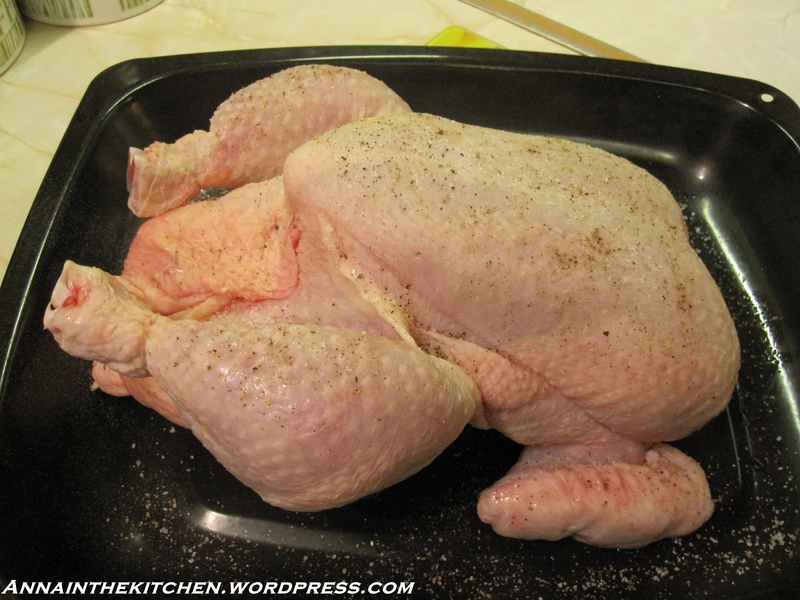 – Take the chicken out of the packaging and place in a toasting pan. – Snip the string around its legs and unhook the legs from inside the body cavity. – Push the half onion and lemon inside the body cavity. – Sprinkle with salt and a bit of pepper, or even some thyme if you like. – Place in the oven and cook for 20 minutes per pound and an extra 20 minutes on top of that. For example, if you have a 4 pound bird then that’s 1 hour 40 minutes. – Remove from the oven and pick up the chicken using a large fork, let the juices drain for a bit so you don’t drip on your work surface then transfer to your chopping board. – Let it rest for at least 15 minutes before carving. In the meantime make the Gravy. If you don’t want gravy then reserve the juices for stock or soup. Equally if you have leftover gravy it makes a good addition to soups. – Take your roasting pan with the juices and put it on the largest ring on your hob. – Add a splash of water, preferably from your vegetables, and bring to a boil. – In a small mug or dish mix 1 tbsp of corn flour with a splash of cold water. – Pour this into the gravy pan and whisk to blend it thoroughly. – Continue to cook for a few minutes. – Carefully pour into a gravy boat and serve.